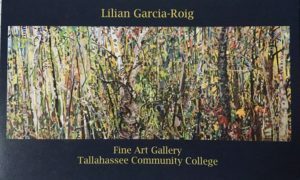 FSU Art Professor Lilian Garcia-Roig is having a rare, large Tallahassee showing of her paintings at the TCC Art Gallery that opens next Thursday, October 12, from 5:30-8. In this solo show titled “In the Thick of it”, she will be showcasing works from various parts of the country where she has painted extensively on-site. There will be numerous fall-themed works as well as some WA and FL banyan paintings. Please note that the gallery is not open during the weekends, so it might be tricky to see the show, but Lilian will be at the opening and hopes to see some of you there.